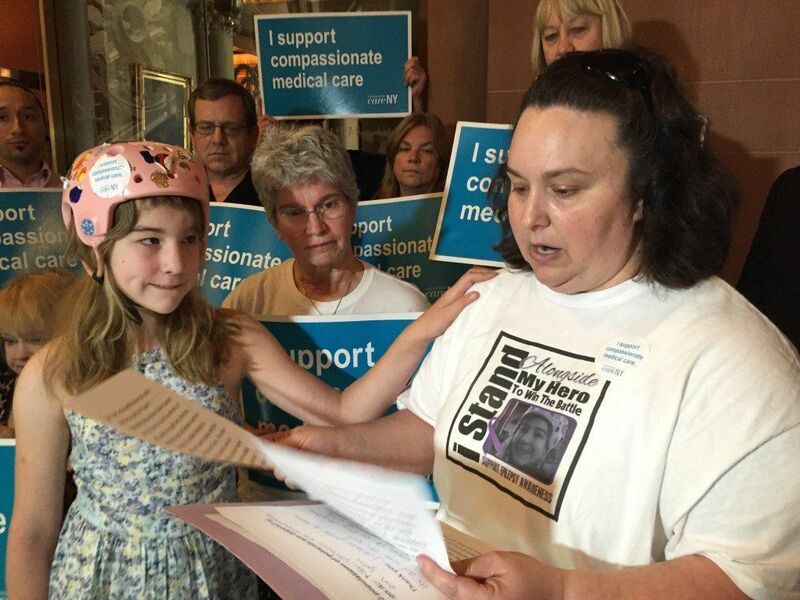 New Yorkers with severe illnesses and legislators urged the Legislature to pass the bill and for Gov. Andrew Cuomo to sign it as the state Department of Health considers medical marijuana growers and hopes to have a statewide distribution system in place by Jan. 1. The state Assembly was expected to pass the bill late Tuesday, but it faced an uncertain future in the Senate and with the Democratic governor. A total of 43 companies are vying for one of five licenses to grow and distribute medical marijuana, according to the state Department of Health. The state posted the list of companies late Tuesday after the applicants dropped off hundreds of boxes of documents ahead of a Friday deadline to apply. Advocates said the state's timeline is too slow for patients who could benefit from medical marijuana for their illnesses, such as children with severe epilepsy. The state last year approved the legalization of medical marijuana for ill people in non-smokeable forms, but the system is still about six months from being up and running. "These children and other patients cannot wait until January," said Assembly Health Committee chairman Richard Gottfried, D-Manhattan, who sponsors the bill. Several families in New York said their children have died over the last year as they waited for medical marijuana to help with their illnesses. The bill would allow for the state to offer a "special certification" to a patient whose condition is "progressive and degenerative or for whom a delay in the patient's certified medical use of medical marijuana poses a serious risk to the person's life or health." Some Republicans in the GOP-led Senate are supporting the measure, but it's unclear whether it will pass in the flurry of activity before the legislative session ends June 17, said Sen. Joseph Griffo, R-Rome, who is sponsoring the bill. "This access is critical for these individuals who are enduring such pain and suffering, but also for the families," Griffo said. Cuomo, though, has indicated that he would prefer to wait until the state system is in place, citing the federal ban on medical marijuana across state lines. The state will issue five medical marijuana licensees that can each have four dispensaries. In a statement last month, Cuomo spokesman Richard Azzopardi said the state is moving as "expeditiously as possible under current federal guidelines" to allow for medical marijuana in forms such as oils and pills to patients. "The last thing that anyone would want is legal complications to arise from importing marijuana products over state lines without federal approval, or for unnecessary delays with the implementation of the current program to come as a result of layering a separate process on top of it," Azzopardi said. Gottfried, however, dismissed the governor's concerns, saying states such as Georgia have been able to work around federal laws to get medical marijuana to patients. "I would think New York could do at least as good as the state of Georgia," Gottfried said. Meanwhile, patients said they continue to be frustrated by the wait. "It is a terrible feeling to watch your child suddenly drop and fall down the stairs in front of you," said Julie Kulaway, a Utica-area mother whose 12-year-old daughter, Mackenzie, suffers from a severe form of epilepsy. Tom Palumbo, a nurse from Waverly, Tioga County, attended Tuesday's news conference at the Capitol along with the patients. He said he's seen a number of cases where medical marijuana could have helped people in his care. "To see people suffering, as a nurse it does take a lot out of you," Palumbo, 55, said. "And when you know you could do something and you're prohibited, that's a terrible position to be in."